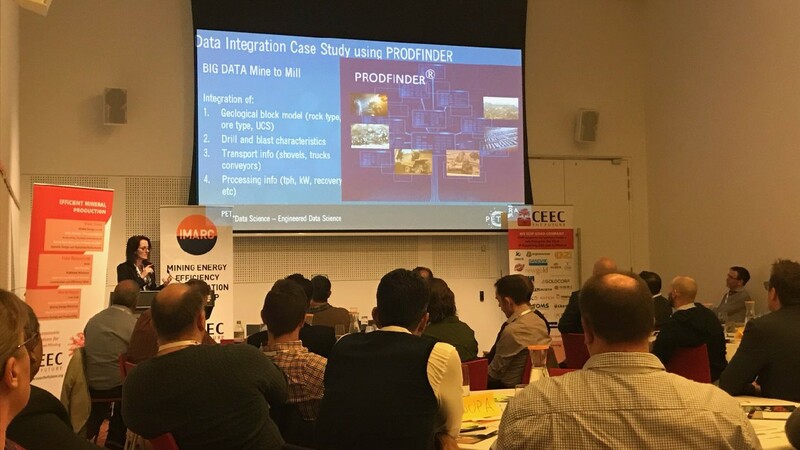 On Monday 30th October 2017, PETRA Principal and CEEC International Founding Director Dr Zeljka Pokrajcic took to the stage at the International Mining and Resources Conference (IMARC) CEEC Smart Mining Efficiency Workshop. Zeljka showed how MAXTA® integrates geology, blasting and mining data to predict and map plant performance. MAXTA is a platform agnostic real-time machine learning version of our previous PRODFINDER big data to mill study methodology. MAXTA can deployed on any platform, and is also available as a web application. Dr Pokrajcic’s case studies showed how PRODFINDER helps companies predict and optimise across the value chain (e.g. mine-to-mill). A mineral processing professional with 20 years’ experience in the global mineral industry, Zeljka specialises in the commissioning, operation and optimisation of comminution and separation circuit. She holds a PhD in the design of energy efficient comminution circuits and was awarded the international TMS prize for her work. “Digital technologies, such as big data, data science, IoT, machine learning, and artificial intelligence are enabling new ways to drive productivity, manage the variability challenges of the mining sector and pursue commercial excellence,” she said. Zeljka would like to thank CEEC International for hosting a highly interactive and engaging workshop. The workshop provided attendees with practical tools, operational insights and new knowledge for energy efficiency innovations and opportunities.